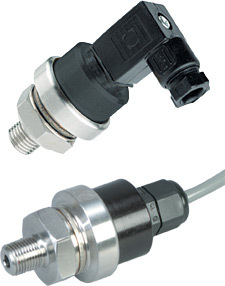 Omega’s PX481A series transducers are designed for general industrial and commercial requirements and offer excellent performance in a wide range of applications. They are based on proven micro-machined silicon technology, providing high reliability, long-term stability and low cost. The PX481A is fully digitally compensated for the effects of pressure and temperature change. It is extremely accurate, less than 0.3% FS reference accuracy, and less than 1% FS over its compensated temperature range. Wetted parts are made of 316L stainless steel for a wide range of media compatibility. Models shown in table have cable terminations. To order with DIN connector termination, change model number to PX481AD. Nota: To order models with a miniture DIN connector instead of pigtail leads, replace PX481A with PX481AD (mating connector included). See Custom Part Number Builder below.